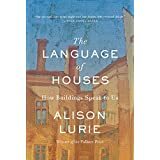 I’ve read Alison Lurie’s fiction with pleasure so thought I would try a nonfiction. This is an in depth book of how buildings, public and private, influence our lives. She begins with materials and styles, which depend on location, finances, and vision, and takes us though all kinds of houses and buildings — houses of God, Art and Science, Schools, Prisons, Nursing Homes, Restaurants, Commerce and everything but Libraries! (I kept thinking she would mention libraries but I only found this reference: she is talking about colleges and says that “at least one iconic building, a stylized image of which appears on their website, letterhead, backpacks, and T-shirts…frequently is the library or administration building.”) Too true. The book made me think of places I’ve been and the vibes they gave off, and reminded me to pay attention to how our surroundings affect us. This entry was posted on October 31, 2014 at 3:49 pm and is filed under Uncategorized. You can follow any responses to this entry through the RSS 2.0 feed. You can leave a response, or trackback from your own site.